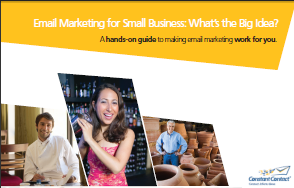 A hands-on guide to making email marketing work for any small business. You’re considering email marketing to promote your business? Smart Move! Congratulations, you’re about to step into the world of email marketing – one of the smartest ways ever for developing your business. And to help you get started, here’s a bird’s-eye view of what email marketing’s all about – from planning, to getting your campaign going, to making it successful. Good, Fast, or Low Cost Marketing? Do You Make Every Contact Count? Why Would Your Customers Read Your Email? How Can You Get Your Email Opened? What’s The Right Email To Send? One final word of advice – don’t wait. The sooner you launch your campaign, the sooner you’ll see how successful it can be. Free 60-Day Trial!